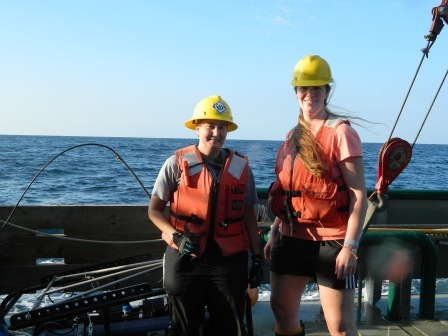 Another great part of conducting science research at sea is meeting and working with a number of graduate and undergraduate students. 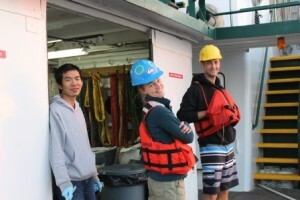 This C-IMAGE cruise we have sailing with us, Elizabeth Brown and Bo Yang from USF College of Marine Science and Matt Flynn from Eckerd College. As well as, Brian Wells and Lee Russell from Florida State University as part of the DEEP-C consortia (see their blog entries). Enjoy these stories about the USF students aboard. Hi! I’m Elizabeth. I’m a paleontologist – I’m not the kind who studies dinosaurs (although I love dinosaurs), even if I always get asked that ^^;; I study marine microfossils; tiny creatures the size of a grain of sand, some of them only a single cell, called foraminifera, or “forams” for short. Forams are among the oldest creatures in the evolutionary record. The oldest we’ve found are over a billion years old, and the genus is still going strong today. That’s what makes them so critically important to people like me, who study how the ocean has changed over the ages! Larger, more famous fossil animals, like mastodons, dire wolves, megalodon sharks, pterodactyls , and triceratops are wonderful, but they lived for relatively short periods of time in the big picture of geologic history. It’s like judging a photo album by a single snapshot. Studying how the tiny forams lived & evolved for so long gives us a much broader idea of changing earth, glaciers and oceans. You know that phrase “You are what you eat?” Well, turns out, that’s true! Forams build their bodies and skeletons, incorporating various nutrients and elements (calcium, magnesium, barium, carbon, oxygen, etc) directly out of the ambient seawater. Their fossil remains are therefore a snapshot of the ocean chemistry at the time the creature was still alive. What’s more, ocean chemistry changesin mathematically predictable ratios with major changes in the environment: major temperature changes, major shifts in salinity, global sea level vs. formation of huge glaciers on land, all kinds of things you’d never think you could see through a fossil plankton (woah!). In short, by breaking down fossil skeletons of tiny forams, analyzing their chemical proportions, and doing a little back-calculating, I can track the evolution of the oceans through the ice ages. How crazy is THAT!? 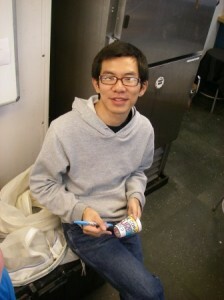 Bo Yang is a third year graduate student at CMS in Dr. Byrne’s lab. 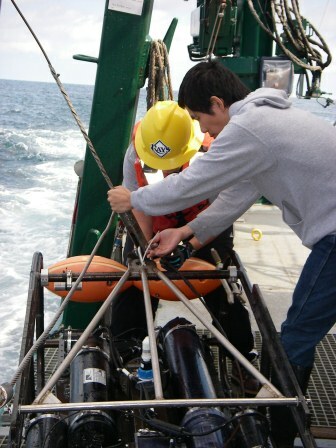 He is working with a team of scientists conducting long term monitoring of the CO2 system in Gulf of Mexico, a research project sponsored by NOAA. 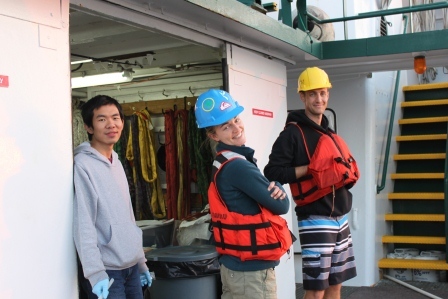 His team measures four things in seawater–the pH, carbonate ion concentration, dissolved inorganic carbon (DIC), and total alkalinity (TA). Two measurements must be measured on board because they are very sensitive to interactions with the atmosphere; these are pH and carbonate ion concentrations. 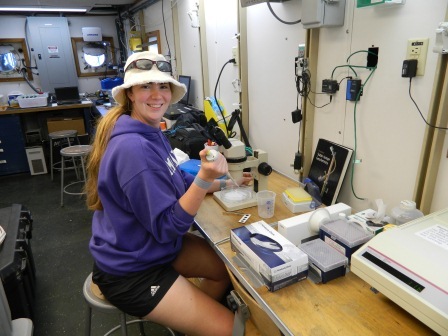 Bo uses spectrophotometric methods to measure the pH and carbonate ion concentration soon after the seawater samples arrive onboard from the Niskin bottles. These methods are the most accurate in detecting very small changes in the ocean’s chemistry related to acidification. The dissolved inorganic carbon and total alkalinity are measured on shore on shore in the lab from the water samples collected while at sea. 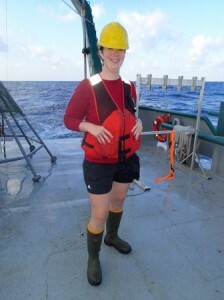 Why monitor CO2in the ocean? Print article This entry was posted by greely on February 11, 2013 at 2:09 am, and is filed under Oceanic Updates. Follow any responses to this post through RSS 2.0. You can leave a response or trackback from your own site.